What are SIPs? — Prairie Panels Ltd.
where does prairie panels get its sip Panels? We have been working with SIPs for many years as a reseller and installer. We are now proud to announce that we are a manufacturer!! Our panels are made right here in Saskatoon by us using Canadian sourced materials. We are very excited to be Saskatchewan’s first manufacturer of SIPs!! We are able to build, supply and install our panels for our clients. We can also supply our panels to any person or company that would like to do the install their self. We can offer a full package to match your drawings and specs as well as engineering services. 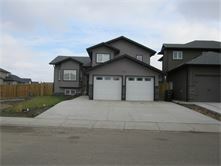 We will provide all supplies needed to complete your build and will teach you what you need to know to do your install. An SIP or Structural Insulated Panel in itself is quite simple. A Polystyrene foam board core is laminated together with OSB plywood on both sides. This creates an incredibly strong, straight and energy efficient result. SIPs can be used for walls, ceilings and floors in all types of construction. This product merges the structure, sheathing, insulation and vapour barrier into one single process. This means that when a panel goes up and is fastened in place, all 4 of these steps are complete instantly. A closer look at the panel construction. There are may benefits in comparison to conventional construction. Energy Efficiency – By far the biggest benefit of a SIPs structure. You will save up to 60% on heating and cooling costs – forever! Strength - Continuous reinforcement from the high density foam core gives the panels superior strength in both load bearing and shear strength when compared to wood framing. Design Flexibility - There are fewer restrictions to design and more choices to customize, from a simple cabin to a complex mansion. Quieter and Healthier living environment – EPS insulation is an excellent sound barrier, and the naturally tight construction of a SIP shell will prevent dust and allergens from penetrating your home. Interior Finishing made easy – No studs to find! The OSB surface provides a sturdy and continuous nail and screw base to which interior finishing materials can easily be attached. You will never have to look for a place to support a nail for pictures, curtains or cabinets ever again. Green Product – SIPs are environmentally friendly, fewer trees are required to build your home. 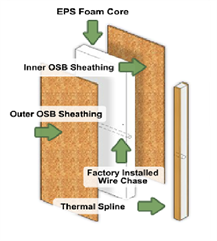 OSB is made of wood particles left over from milling processes which means less lumber in your walls! Premium Resale Value – SIP built homes are two to three times stronger and more durable than stick-built homes. Faster Construction – Framing, insulation, sheathing and vapour barrier are combined into one panel. Reducing contractors and wait time. Minimal Jobsite Waste – There is a huge reduction in waste at the jobsite, as packages come fully customized, meaning there is no on-site cutting and fabricating. Less waste means lower costs. Easy to Wire – Pre-cut electrical chases are built into every panel so that the wiring of the outer walls can be easily done. Fully Customized – With our systems, all openings are cut and framed at the factory. Panels are built to the engineer’s specs, taking the hassle and guesswork out of design and on-site quality control. Our panels are Code compliant and manufactured right in Saskatoon area by us. One key attribute to SIPs is how they are delivered to the construction site. They come pre-fabricated and numbered from our manufacturing plant. Splines, corner connections, header material, and blocking around doors and windows come preinstalled. The U shaped ends of the SIP join together perfectly, guaranteeing a tight and energy efficient building. Panels are straight, walls are level, corners are plumb and minimum bracing is required. The result is a building system that will reduce heating/cooling costs by up to 60%, provide a very strong, predictable and cost effective building structure. Structural Insulated Panels are commonly used by builders and contractors to enclose a timber frame home or a post and beam structure. SIPs only make an already strong timber frame home stronger, more air tight, and straighter than other conventional wall construction. SIP roofs provide the ideal cap to a timber frame or post and beam building while offering their advanced insulation performance of R-Values, in some cases exceeding R42. SIPs are straightforward to use and ensure achieving the lockup stage faster while providing a straight and true finishing surface. These durable and lightweight panels can be manufactured in various sizes and thickness. Our panels range in size dependent on the project, the largest panel size is 8'x24'. Panels can also come with fiberglass on the interior skin for commercial or industrial use, or treated plywood on the exterior for basement applications. Prairie Panels was the first company to construct a SIP Home in Saskatoon. We are excited to work with you to design and construct your Energy Smart SIP Garage Package, Carriage House, or Home. Whether you are looking to have us do the complete project from start to finish, or only a partial build (completing the shell of the building to the lock-up stage) we are ready and willing to work with you! We build only with SIPs using SIPSTECH Systems and Technology.We also do Commercial or Industrial Contracting and Structures. A SIP home is clean and fresh. It is air-tight due to the method in which the structural insulated panels lock out the risk of molds and mildews growing behind walls and contaminating the indoor air. Outside air simply cannot get in. This ability to self-insulate translates into savings both for energy consumption as well as size of equipment needed to maintain comfortable indoor temperatures. Typical R-Values of our panels.